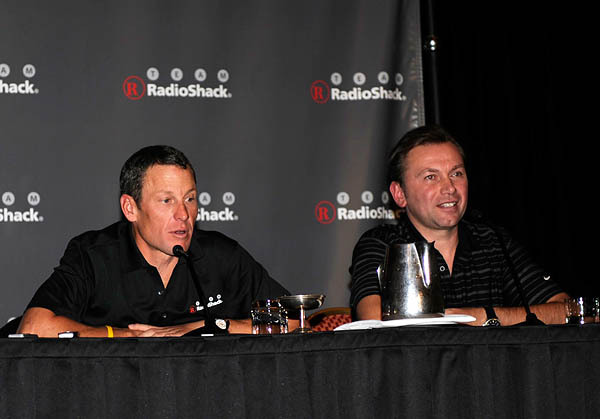 The new RadioShack ProTour team headlined by Lance Armstrong began their first training camp this week in Tucson, Arizona. Given the ongoing (and obsessive) interest in all things Lance, the team invited media to attend a day with the team on Tuesday, allowing us to follow along on a training ride, with Armstrong and team director Johan Bruyneel holding a press conference afterwards (we will be posting the press conference video later). Since all of the riders are still under contract to various teams until the end of the year, the training session resembled a small peloton, with multiple teams represented. The RadioShack team kit will not officially be unveiled until after December 31st, but yesterday we did post a shot of Lance Armstrong wearing a 'draft' version of the jersey. Ottawa native Geoff Brown, one of the mechanics with the team, says that at this point the Trek bikes the team is riding are almost identical to the ones used in the past Tour (with the exception of graphics and paint). "Trek likes to introduce new stuff through the year, so we could see something totally new for the Tour. At the roughly 35 minute long press conference, Armstrong answered a wide variety of questions, from what his program will be (at this point, Tour Down Under, Murcia, Tour of California, Tour de France), to "if he were a bike component, which one would he be?" (that one stumped Armstrong: "I've never been asked that question before..."). Below are some of the highlights, with full responses to come in the video postings. Leading up to this year's Tour, did you think you would be as competitive as you were? "In the days leading up to the Tour I thought, yeah, I could still win it. By with Albert (Contador) on another level, above anyone else in the race, it wasn't possible in 2009." Armstrong was also asked about the conflict with Contador, and how he had thrived on conflict in the past. "This was a different type of conflict, of personalities, something that I had not had before." Armstrong says that he believes Contador is one of the most talented riders he has ever seen "someone who can time trial and climb, and very hard combination to beat." However, RadioShack has eight of the nine riders who rode the Tour last year for Astana, and that they have the strongest team possible. In 2009 you had something to prove after years off the bike. What's the hunger like now, with this new team built around you? "At the time it was just a one year plan, and I didn't expect to be racing again in 2010. But despite the rough times I still enjoyed it and I said to myself that I wanted to do it again. The team in 2009 was a complicated situation for a lot of reasons, and now with RadioShack we have an opportunity to put together a program that can provide a launching platform for the [U23] Trek-Livestrong team. So I'll keep going and enjoy this, but I will say that the days of a team being built around me are over. I think we have to go into the Tour as a team, looking at Levi [Leipheimer], looking at [Andreas] Klöden, we have to look at the entire team. Those days of the team being built around me are done, they are over." Pro cycling looks like it is becoming more anglo-saxon, with four or five new teams in America and Great Britain (Team Sky). "I agree that there are more English-speaking teams - a number of American companies have stepped forward. I would also say that it wouldn't surprise me to see an Australian team contesting at the Tour de France in the next few years. The sport is becoming more global. But like everything in cycling, it's cyclical, and we just caught it at the right time, with companies like RadioShack that want to be involved." Armstrong was also asked about his plans for posting results of blood testing on the web, and the team plans for private testing. He was also asked about the values from the Tour which were posted and later removed after a Scandinavian researcher suggested they were suspect. Armstrong and Bruyneel both took this question with the team director explaining that the former company they used is now working for the UCI biological passport program, and therefore unavailable. Armstrong also stated out that the testing agencies (WADA, UCI, USADA, etc.) weren't necessarily happy with all the private testing (saying that they felt it offered unnecessary duplication of their efforts), and that the 50-plus tests he had over the season made it unnecessary for additional private testing. With respect to the suggestions that his Tour blood values were suspicious, Armstrong stated that all it took was one scientist looking to make a name for themselves, and a journalist looking for a story to write, to create a black mark against his name which was impossible to refute. Thus they removed the online posting of blood values. Armstrong's language was certainly more colourful on the subject, clearly implying that the analysis was nothing more than an attempt to gain publicity for the scientist in question - "someone who was possibly last in his class..."
"Everyone know's where I am, every minute of every day and the number of times I've been tested. I'll let that speak for itself."